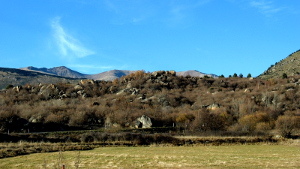 Halfway located between Dorres and Font-Romeu, the chaos of Targasonne offers a scenery of hundreds of granite blocks lying on a slope at an altitude of about 1500 m, facing south. Dominated by the totem of the Themis electric experimental installation they emerge from the hazel tree forest. These rocks often have a name: Barratas (big hat) and Napoleon's hat or eagle. From this viewpoint the landscape extends just in front over the vast mountain chain, towards the Puigmal. The stonemasons coming from Dorres and Angoustrine formerly came to the chaos to take the granite they cut up on site. Today it is frequented by climbers coming from all over the region to train on these huge rocks. They appreciate climbing routes with varying difficulty. Sculpted by the erosion, these rocks are a paradise for climbers. Nearly 1000 blocks are listed according to their difficulty, from very easy (children) to very hard.